Juice Glasses, Tea Towel, Pitcher, Latte Bowls, Plates and Mugs all from Anthropologie. I always look forward to changing my home decor as the seasons change and whenever holidays happen (we finally took down our Christmas tree!! It only took a month ;). I love living in Utah because we get to experience all the seasons and they’re all so drastic and different! I know technically Spring doesn’t start until mid-March, but I’m already mentally and physically ready for it (who’s with me?!). Anthropologie has always been one of my favorite places to shop for home decor and they just released a batch of new arrivals that got me SO excited for Spring! So pretty! I love the sweet pastel pink and green together. The perfect springtime combination! I think it’s hard NOT to be obsessed with Anthropologie! I could live in their store! Pretty photos and I am so ready for Spring. These home decor pieces are adorable! I love these pieces! Can’t wait for spring to come! Ahhhh makes me long for spring already. Beautiful kitchen! I love all of these pieces! They’re so gorgeous! I love anthropolgie!! They have the CUTEST home goods, seriously. Great picks! I can’t wait for spring! 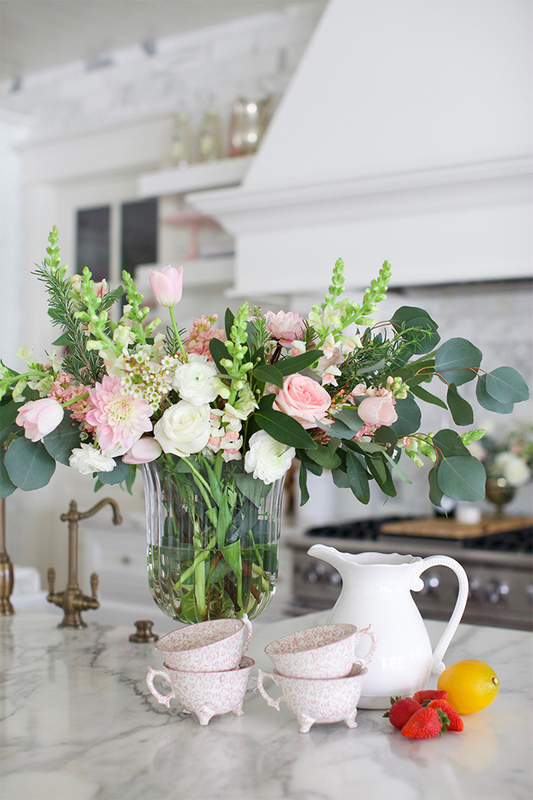 Love these beautiful touches you've added to your house! It looks so fantastic. This is beautiful! Obsessed with everything you do with your house. I am with you, Rach! Can’t wait for spring. Haha! I love your house! you did such a great job designing it! I am already ready for summer over here! I sometimes miss the seasons living in california, only until i see all that snow though! Cute stuff! Yes I am getting ready for Spring! I love the teacups, such a pretty design! 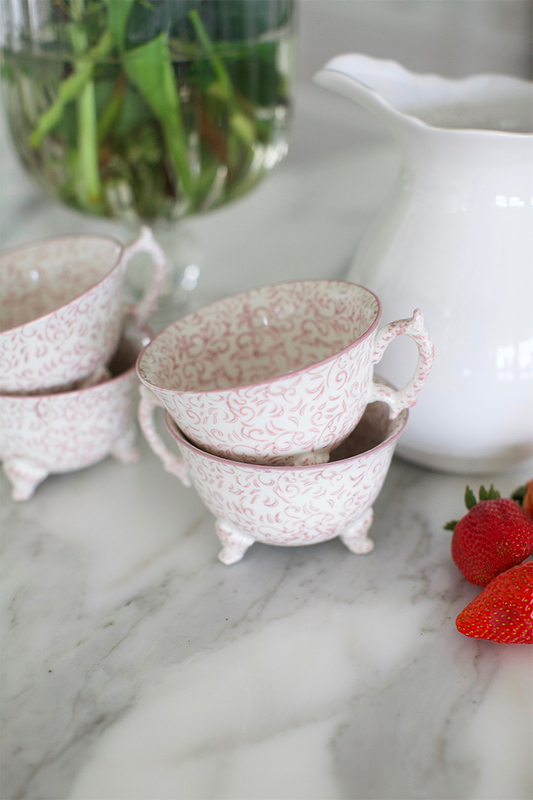 Those little tea cups are ADORABLE! Anthropologie is a go to for me as well! Loving the pink and green pastel combination!! The decorative bottles of juice/water/etc is so weird as a trend, but why would you ever put it at the very top shelf? honestly, your kitchen is a snooze fest. get some inspiration, talent, and do it right! I don’t understand why people have to be so negative and rude… we all have different taste. Top shelf may be perfectly suitable for sugary drinks in pretty bottles. After all, you only drink them every now and then, and why hide such beautiful items in the cupboard while storing? You seem to have a firm taste in kitchen decoration, so by all means post a picture of yours for us all to see! The tea cups are utterly adorable! I love those bowls, the color is gorgeous!!! I LOVE anthro!! 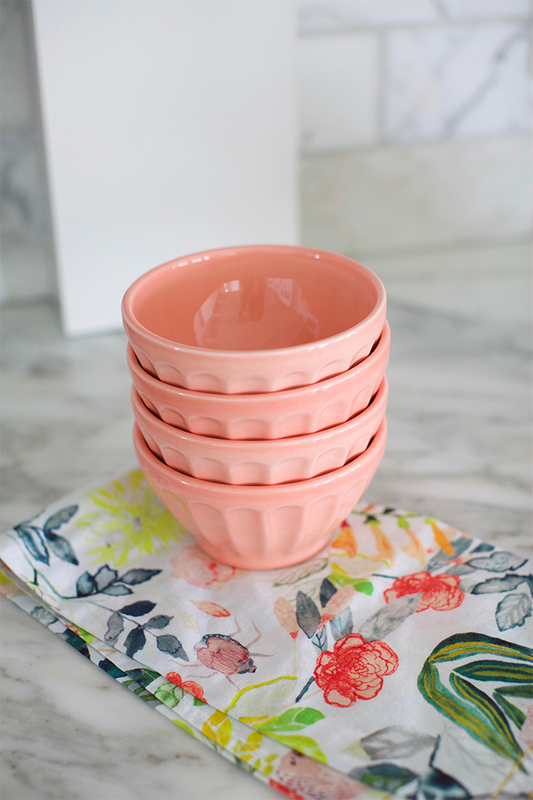 Super cute dishes just perfect for Spring! I love this look!! Great job? Gorgeous features! I love how all of the pieces are different but they share similar colours, it means they all go together nicely but don’t look too matchy-matchy. Perfect! Spring can’t come any sooner for me and this post is getting me even more excited! Love! Anthropologie always has the BEST home decor! Loving all these new additions! Anthropologie is an addiction! LOVE all their cute home decor and kitchen peices! Those flowers are so pretty! I love all of the blush shades. so lovely! Thanks for sharing, hope you had a great weekend! Loves! 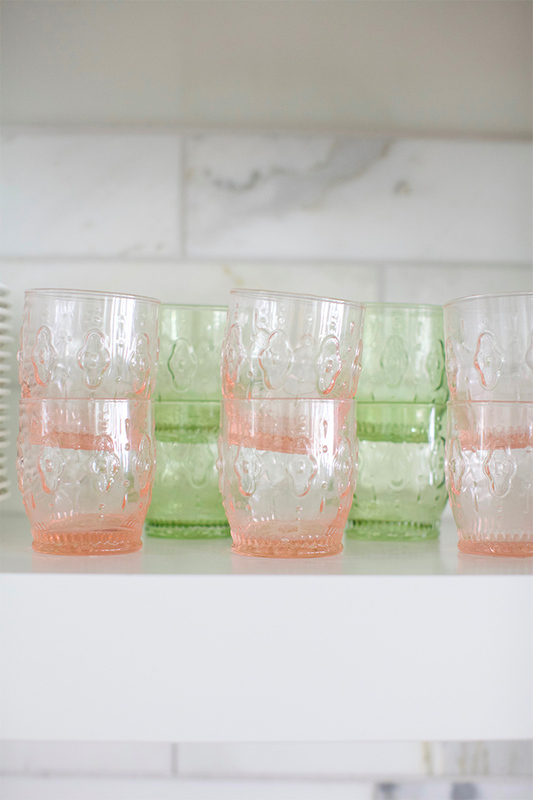 Such pretty glassware! Anthropologie has the cutest kitchen stuff? I love Anthropologie home items! The pink is so pretty! your home is so stinking pretty!!! and seriously, can spring get here like NOW?!?? Your house is like something out of a fairy tail book, so beautiful and so my style too! Any chance you can let me know where I can get these extra wide white floating shelves? Are they custom made? They are exactly what I am looking for!!! By any chance can you tell me where the extra wide white floating shelves are from? Are they custom made? They are exactly what I have been looking for!! Love the entire anthro home collection for this spring. Adding soft pinks makes the dreary winter days a bit more fun! I love any and all anthropologie! These dishes are to die for and have the perfect vintage touch. I wish you could help me decorate my place…you always have the prettiest taste! Pretty!!! I love that peach / rose gold color scheme!! I love all of this! So cute. Okay, I am in love with your kitchen! 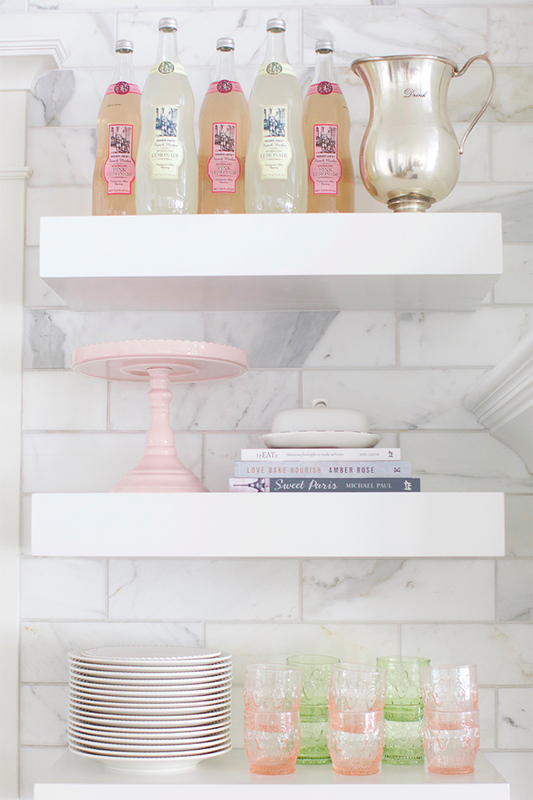 Love your pictured shelving unit and your picks from Anthropologie. Can’t wait for spring! Love this! So slight and gorgeous! So beautiful!! I love those colors. Love Anthropolgie too and am definitely ready for spring!! Love the décor, and changing with the seasons too. The flowers are beautiful. You inspired me to get more fresh flowers in my own home. This is beautiful and looks like my dream kitchen. Could you please let me know where your floating shelves are from? Thanks!